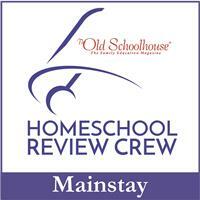 Home School in the Woods offers a lot of hands-on products to teach children both world history & U.S. History. 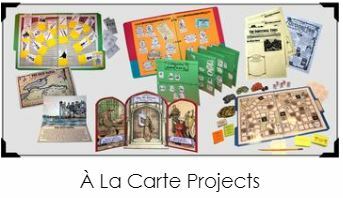 We have used several of their products in the past and this time we got to choose items from their Á La Carte Projects. Years ago I purchased the Timeline Collection: All Historical Timeline Figures Cd as well as the Suggested Placement Guide from Home School in the Woods. The first lapbook we created from them was Hands-On History Activity-Pak: Composers. We have used the Timeline Collection for so many projects during our homeschool years and my girls still talk about the Composers Pak. This time we were given a dollar amount to choose up to three items from the Á La Cart Projects. Alaina still loves projects for school so I let her choose what she wanted. She chose The Industrial Times & Grocery Sales Flyer, The Jamestown Replica, and Pirate Panoply. 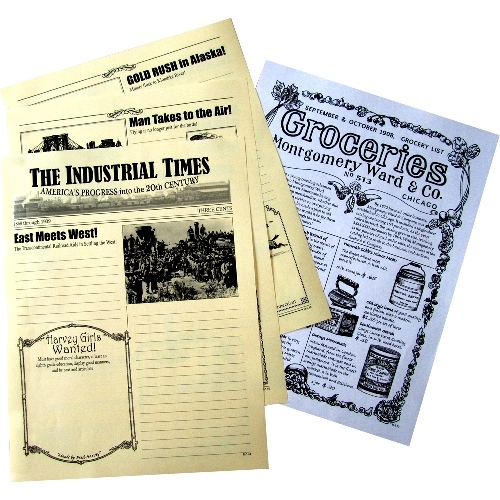 The Industrial Times & Grocery Sales Flyer is recommended for students in grades 3-8. This is a creative writing project where the student creates a newspaper about the Industrial Revolution through the Great Depression. There are 12 pages to make up The Industrial Times. Each page has several spaces for different articles and pictures. The article sections are all lined and already include a title. 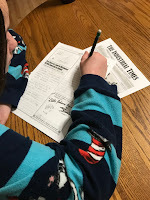 The student just does some research for the topic or writes from what they already know to create a newspaper article. The Grocery Sales Flyer is a double sided flyer to advertise items sold in a grocery store in September & October 1908. 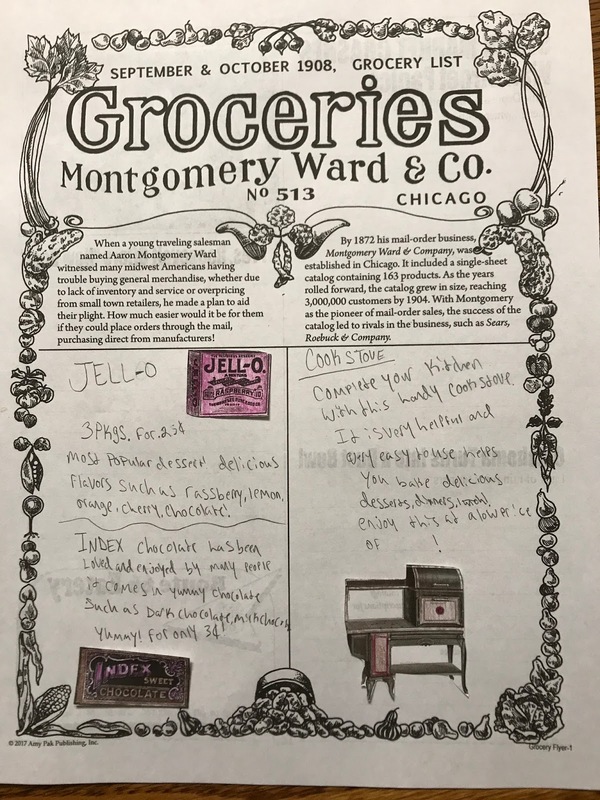 It includes two sheets of products that can be cut out and attached to the flyer and the student can write a description and cost of the item. There is also a sample flyer and some additional examples of product descriptions and item costs. 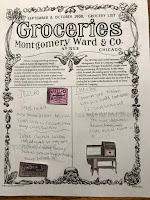 Of course Alaina's favorite part of this Á La Carte Project was the Grocery Sales Flyer. She had fun researching items for sale back in 1908 and comparing their price and labels to our products today. The Jamestown Replica is a download that will be a 3D model of the Jamestown fort how it would have looked over 400 years ago. After downloading the file the directions are very easy to follow. They indicate exactly which pages need to be printed on cardstock and if they should be on different colors. The only additional materials needed you probably already have around the house. 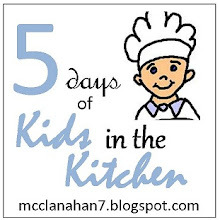 You will need glue or double-sided tape, scissors, paper clip, toothpick, colored pencils, and a ruler. There are three pages to be colored and cut out before assembling. Alaina is 13 and she completed the project on her own. The directions were easy enough for her to follow on her own. 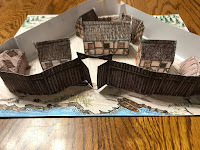 This is a fun activity if you are learning about Jamestown or just a fun little activity to complete. 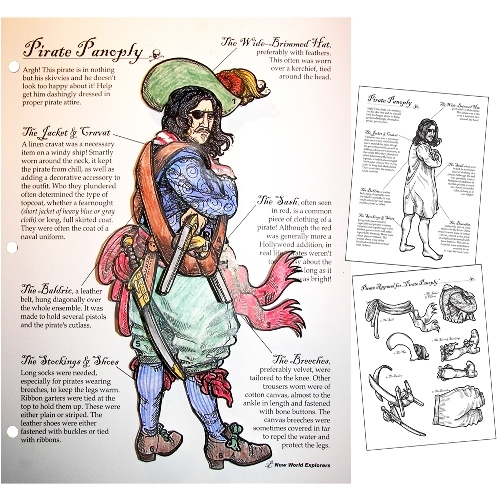 Pirate Panoply is actually a game to learn about the different parts of a pirate's outfit and can be played with multiple people. 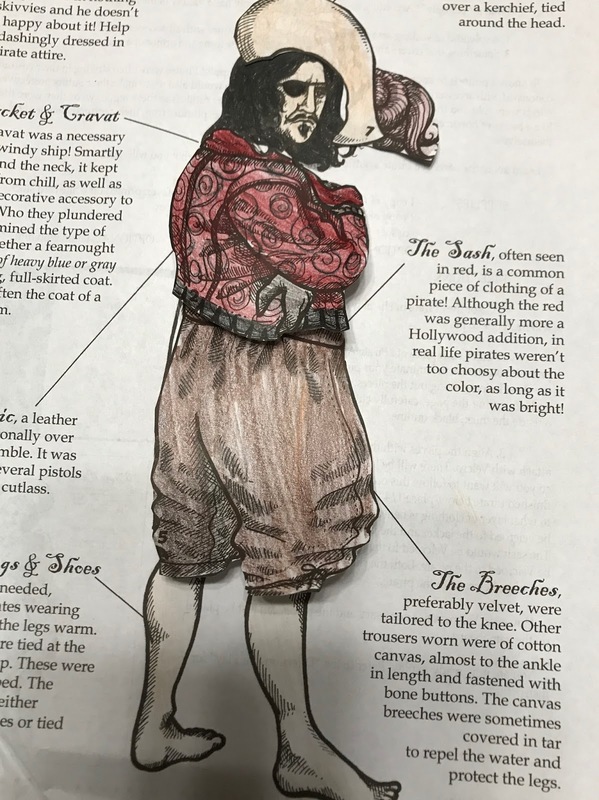 Each player will need a picture of the pirate in his skivvies to use as their game board and one set of the pirates clothing for their pieces. The only additional thing you will need is a die. Laminating the clothing and attaching velcro to each piece is also suggested and would be very beneficial if you have younger children or plan on using the game boards over and over. Each player takes turns rolling the die and attaching the corresponding piece of clothing to the pirate. The first person to completely dress the pirate is the winner. What exactly is a panoply? Alaina learned the meaning of this word and we all had fun playing the game. 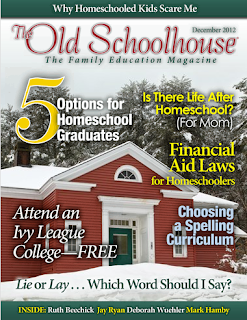 Home School in the Woods is ran by Amy Pak and her family. They do homeschool in the woods and they really understand history. By adding their products to my children's education they can visually see history come to life. The hands-on activities really get them involved in the past of the United States and the world and they think they are having fun. Members of the Homeschool Review Crew were offered our choice of the Á La Carte Projects which included games, timelines, newspapers, lapbooks, and more from different time periods. 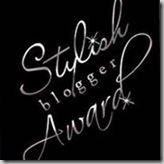 I like the looks of The Penny Rug Notebook and The Art of Quilling, so stop by the Crew Blog to read those reviews.